"Our family lives in Kent and we focus on the campus of Kent State University working in partnership with Reliant Missions. We serve H20 campus church and the broader H20 Network throughout Ohio (and the National Collegiate Network). We reach out to the younger generations who are increasingly interested in their spiritual journey. Promoting ourselves to the campus as "Church for Your Journey", we encourage individuals in their personal faith, help to develop leadership skills and offer leadership opportunities here and in Europe. We spent 10 years in the Netherlands working with an international team of y young people to establish a church, named Amsterdam50 in the heart of the city. As we started to see the European leaders stepping up to carry on the work, we were called to return to Ohio to encourage Kent State students to develop their own campus church. We hold services in Bowman Hall. In both Ohio and Europe we continue to see God work in extraordinary ways." 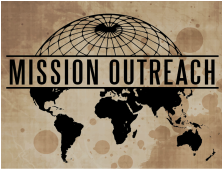 The Missions Committee is responsible for keeping the congregation informed concerning the various missions we regularly support financially as a church. • Brandon and Hannah Baughn TEAM community education Pakistan. Baughns were former members of our congregation. We also support UMC Global Ministries and worldwide Persecuted Church mission. Periodically we receive visits from the missionaries to renew friendships and update us on their mission activities. We organize mission activities such as Sunday School lessons on missions, mission focus before the congregation once a month and highlighting a mission in the Sunday Bulletin. With the help of our card group, we send out handmade cards for birthdays, anniversaries or other special occasions to our missionaries. These small remembrances are very well received. Kids for Christ (KFC) is every Wednesday 3:30 to 4:30 October through April. We provide a Christ centered environment for children ages K-5th grade. During KFC we have fun learning of Jesus' love for us through singing,crafts,games,snack and stories/movies. If you have any questions please feel free to contact Amanda Ziegler. What at Rootstown United Methodist Church has purple and green fur, crazy wild hair, eyes that don’t blink and just stare? No, not the youth group, our puppets, in our puppet ministry! Our puppet ministry is such a fun and unique way to spread the word of God. We try for one puppet skit or song every month and even do extra skits for holidays or special events. There are currently seven members in our puppet ministry, each with a heart to spread God’s word. Puppets captivate people of all ages and can really get a message across. Everyone knows God has a sense of humor, and through puppets it really does show! interested and feel led to join this ministry, please contact our Music Director, Mark Griffith.